The Great Trade Collapse of 2008-9 has given rise to an extensive literature analysing its nature and causes (a notable early contribution was Baldwin 2009). Several stylised facts about the collapse are now commonly accepted. First, there was no great increase in protection during the collapse, implying that protection must only have played a modest role in explaining it (Kee et al. 2011). Second, it was by far the most severe episode of post-war trade decline, and stands out as being unusually synchronised (Martins and Araújo 2009). Third, it was far more the result of a decline in the quantity of goods traded than of a fall in the prices of traded goods (Bricongne et al. 2012, Levchenko et al. 2010). Fourth, it was overwhelmingly due to changes along the intensive margin, rather than the extensive margin (e.g. Levchenko et al. 2010, Schott 2009). Fifth, it saw imports fall more rapidly in some sectors than in others. Trade in goods fell by much more than trade in services. Trade in automobiles and industrial supplies fell a lot, while trade in consumer goods and agricultural goods fell by a lot less (Bricongne et al. 2012, Levchenko et al. 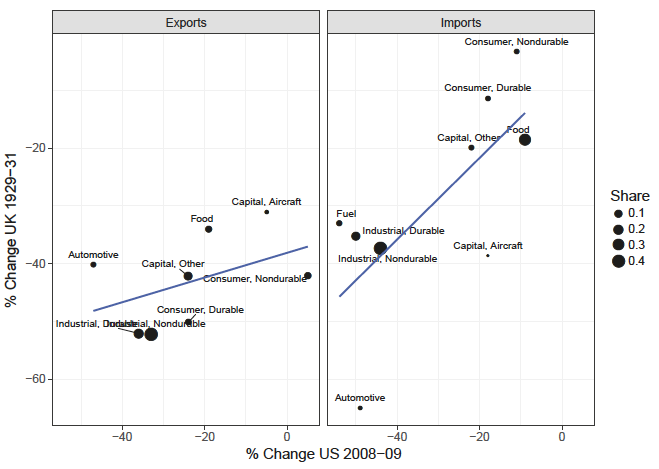 2010), and durable goods trade fell by more than non-durable goods trade (Gopinath et al. 2012, Levchenko et al. 2010). Sixth, the relative contributions of price and quantity to the Great Trade Collapse varied across sectors. In the case of the US, import and export prices of differentiated goods barely declined, implying that the entire fall in the value of differentiated goods trade was due to a fall in quantity. Non-differentiated goods prices fell significantly, however, and thus contributed to the trade collapse in those products (Gopinath et al. 2012, see also Haddad et al. 2010). And finally seventh, Levchenko et al. (2010) find that in the case of the US, the collapse in trade was geographically quite well-balanced, in the sense that imports and exports fell by a lot for all major trading partners. Do these stylised facts reflect the idiosyncratic features of the world economy in 2008, or are they are in some sense ‘typical’ of great trade collapses? In a recent paper (de Bromhead et al. 2018), we explore the extent to which the trade collapses of the Great Depression and the Great Recession resembled each other. Using detailed information from a variety of sources on UK trade between 1929 and 1933, we find that while several stylised facts are common to both episodes, others are not. We also compare thefree trade collapse of 1929-31 with the protectionist collapse of 1931-33 to see extent to which protection, and gradual recovery from the Great Depression, mattered for UK trade patterns. The first stylised fact about the Great Trade Collapse clearly does not apply to the interwar period. The UK trade collapse of 1929-33 took place under two very different trade policy regimes: a broadly liberal one from 1929-31, and a protectionist one from 1931-33. The latter saw not only a substantial increase in protection, but also active discrimination in favour of the British Empire and against the rest of the world. Second, the Great Depression clearly stands out as the period that saw the greatest UK trade collapse over the past century and a half. In comparison, the UK trade collapse during the Great Recession was a much smaller and shorter-lived affair. The third stylised fact relating to the Great Trade Collapse is one that also cannot be applied to the Great Depression. Falling import prices accounted for no less than 83% of the decline in the value of UK imports between 1929 and 1933. In sharp contrast, the UK trade collapse during the Great Recession was entirely accounted for by fallingtradevolumes. What were the relative contributions of the intensive and extensive margins to the Great Depression trade collapse? In order to answer this question, we need detailed information on commodity-level trade, by country. In a companion paper (de Bromhead et al. 2017) we construct such a dataset, for a sample of 258 product categories imported from 42 countries. Using these data, we can decompose the decline in UK imports between 1929 and 1933 in the manner of Kehoe and Ruhl (2013: 380). We find that the intensive margin can account for the entire decline in trade. Despite the many differences between the two trade collapses, the fourth stylised fact about the Great Trade Collapse seems to apply to the interwar period as well. As can be seen in Figure 1, the composition of the 2008-9 US and 1929-31 UK trade collapses was strikingly similar, despite the fact that we are considering two different countries in very different eras. Automobiles and industrial supplies were the most affected in both cases, consumer goods and food the least. 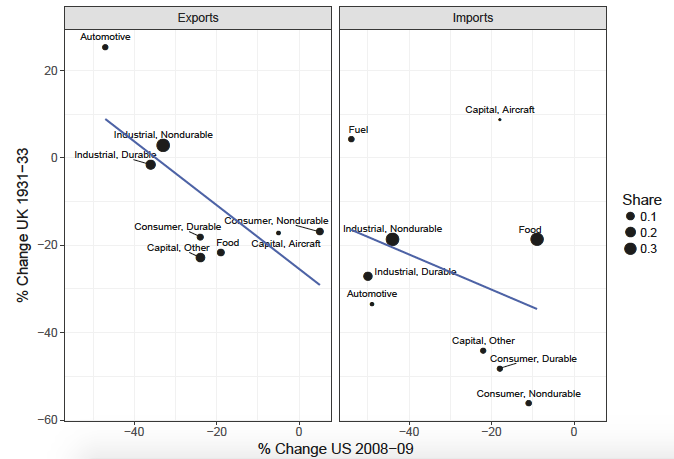 The correlation across categories between the extent of the import collapse is positive and strong. The lower panel of Figure 1 tells a different story, however. The cross-category correlation between the US Great Trade Collapse, and the UK trade collapse of 1931-33, was actually negative. Source: Authors’ calculations, based on Statistical Office, H M Customs and Excise Department (1935) and Levchenko et al. (2010). The sixth stylised fact regarding the Great Trade Collapse of 2008-9 has to do with the differing price changes for different types of goods. In particular, Gopinath et al. (2012) find that while US exports and imports of non-differentiated goods saw a 16% price decline on average, differentiated good prices fell on average by approximately only 1%. Categorising UK trade statistics in a similar manner reveals that non-differentiated export and import prices fell by roughly 15-17% between 1929 and 1931, rather similarly to the price changes experienced during 2008-9. However, the prices of differentiated goods also fell, though by much less (9-10%). Prices also fell more for non-differentiated than for differentiated imports between 1931 and 1933, and prices did not fall at all for differentiated, durable, imported manufactured goods. The final stylised fact indicates that, for the US, the Great Trade Collapse was remarkably balanced across trading partners. Was the same true for the UK during 1929-33? 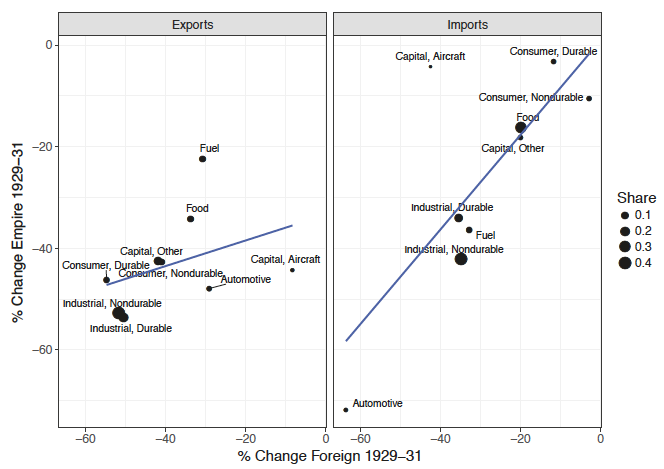 Figure 2 plots imperial versus foreign percentage changes in export and import flows, in 1929-31 and 1931-33, for the same nine goods categories that we considered previously. As can be seen, during 1929-31 categories that saw their trade fall by more vis à vis the Empire also saw larger declines vis à visthe rest of the world. 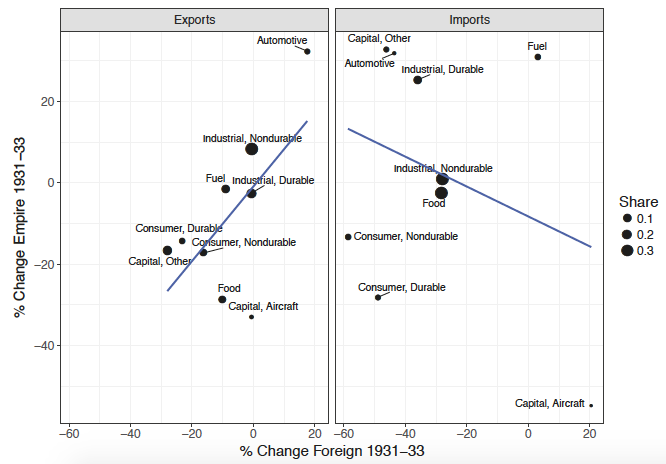 The same underlying forces were lowering trade with both groups of countries. The same remained true for exports after 1931, but the correlation becomes negative for imports, a finding consistent with the UK’s switch to protection having had a major impact on trade flows (de Bromhead et al. 2017). Source: authors’ calculations, based on Statistical Office, H M Customs and Excise Department (1935). The Great Trade Collapse of 2008-9 and the trade collapse of 1929-33 took place in very different economic environments. The Great Recession was violent indeed, but much shorter-lived than the Great Depression. The interwar gold standard implied worldwide deflation, of a sort not seen in the later crisis. Trade policies remained broadly liberal during 2008-9, in sharp contest with the dramatic switch to protection experienced after 1929 worldwide (and after 1931 in the UK). Nonetheless, the similarities between the two trade collapses are supportive of theoretical accounts of the Great Trade Collapse emphasising the composition of expenditure changes during major economic crises, or the relative sizes of firms operating closer to or further away from the margin between exporting or not. It should be emphasised, however, that we have only provided evidence for one major interwar economy, the UK, in much the same way as many writers on the Great Trade Collapse have focused on the US. It remains to be seen whether the stylised British facts that we have uncovered were common to other economies during the interwar period. Baldwin, R (2009) (ed), The Great Trade Collapse: Causes, consequences and prospects, London: CEPR Press. Bricongne, J-C, L Fontagné, G Gaulier, D Taglioni and V Vicard (2012), “Firms and the global crisis: French exports in the turmoil”, Journal of International Economics 87(1): 134-146.
de Bromhead, A, A Fernihough, M Lampe and K H O’Rourke (2017), “When Britain turned inward: Protection and the shift towards empire in interwar Britain”, CEPR Discussion Paper 11835.
de Bromhead, A A Fernihough, M Lampe and K H O’Rourke (2018), "The anatomy of a trade collapse: The UK, 1929-33", CEPR Discussion Paper 12626. Gopinath, G, O Itskhoki and B Neiman (2012), “Trade prices and the global trade collapse of 2008–09”, IMF Economic Review 60(3): 303-328. Haddad, M, A Harrison and C Hausman (2010), “Decomposing the great trade collapse: Products, prices, and quantities in the 2008-2009 crisis”, NBER working paper 16253. Kee, H L, C Neagu and A Nicita (2011), “Is protectionism on the rise? Assessing national trade policies during the crisis of 2008”, Review of Economics and Statistics 95(1): 342-346. Kehoe, T J and K J Ruhl (2013), “How important is the new goods margin in international trade?”, Journal of Political Economy 121(2): 358-392. Levchenko, A A, L T Lewis and L L Tesar (2010), “The collapse of international trade during the 2008-09 crisis: In search of the smoking gun”, IMF Economic Review 58(2): 214-253. Martins, J O and S Araújo (2009), "The Great Synchronisation: Tracking the trade collapse with high-frequency data", Baldwin, R (2009) (ed), The great trade collapse: Causes, consequences and prospects, London: CEPR Press. Schott, P K (2009), “US trade margins during the 2008 crisis”, VoxEU.org, 27 November. Statistical Office, H M Customs and Excise Department (1935), "Annual statement of the trade of the United Kingdom with British countries and foreign countries for the year 1933", London: H M Stationery Office. Lecturer in Economics, Queen's Management School; Research Associate, Queen's University Centre for Economic History.